Zen out your tofu. 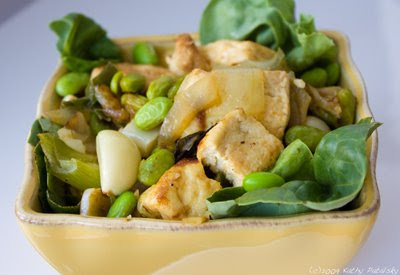 Instead of simply adding tofu to your green salad, combine the green-salad-and-tofu into one blissful bite that is pure green zen. Easy to be Green. 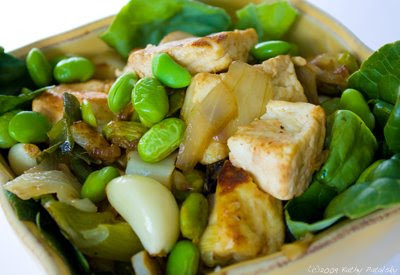 A super healthy dish, my recipe combines fresh fluffy firm tofu, crisp Boston lettuce, sweet cooked garlic and ginger, bright scallions, protein-rich edamame, soy sauce and an accent of sweetness from an agave-lemon salad dressing. Healthy Zen. This salad is an excellent source of protein, antioxidants and fiber. A light bite that is rich in healthy fats and protein to keep you satisfied and zen-inspired, throughout your busy day. In a soup or saute pan, add oil, soy sauce, garlic, ginger and scallions. Saute for a minute. Add tofu. Cover pan. Let simmer on medium for 3 minutes. Shake pan every few seconds. 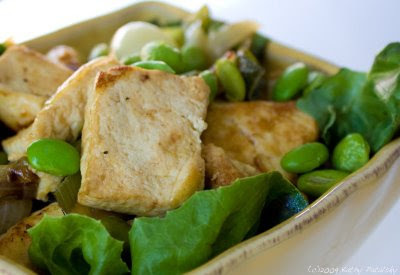 Steam will cook tofu while keeping it moist. Add 2 Tbsp oil-water mix if saute looks dry. 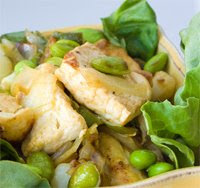 Uncover pan and add pre-cooked edamame. Tofu should be fluffy and cooked through. Add black pepper and saute uncovered for another few minutes. Toss greens with agave-lemon dressing. Transfer greens to small serving bowl. Top with steaming hot tofu saute. Garnish with additional edamame or fresh chopped garlic. Optional Add: Side of brown rice for a larger meal.